"Cobblestone" began as a dream with my first dog. As a kid I showed horses and then dogs. I finally convinced my parents to let me get my own dog after training and showing dogs for other people. We selected a Shetland Sheepdog for their size and trainability. My blue merle Sheltie was named "Fanfare's Cobblestone Blue C.D." 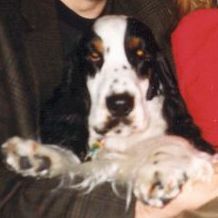 I vowed that someday I would have a kennel and stable to honor my first dog "Stoney". And that is how I came to have Cobblestone English Cocker Spaniels. 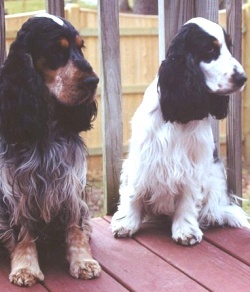 I returned to the dog world several years ago when my friend Rick decided to adopt a 15 month old English Cocker Spaniel, Ryan. Rick and I co-own Ryan but I wanted an ECS of my own. Particularly a blue roan and tan boy, so "Teddy" joined our growing home of English Cockers. This is a picture of Teddy (left) and Ryan (right) on our back deck. Next came my desire for a girl and so "Sadie" rounded out our kennel, and Cobblestone was born! dba Cobblestone English cocker Spaniels.